Truly Badass Dragon. Card Artwork. Monster Type: Flaming Dragon Metal God. The Truly Badass Dragon is the metal god of the Lyre Age. Capable of shredding riffs and power solos, the Truly Badass Dragon's music will melt thy faces off if his fire-breathing hasn't already done so. He is a beast that can rock so hard as he is not a mortal man. So, beware of the Truly Badass Dragon, for he will crush with the power of METAL! One of the first ideas my friend, Nick, came up with for the first set of ideas for thy Dunjon Quest. 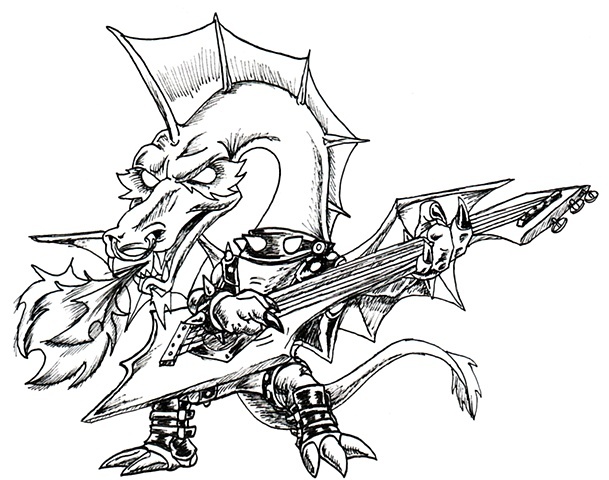 A metal rocking dragon, which he asked me to draw and, with his approval, rendered for him in card art form.